Pt Deendayal Upadhyaya Institute Delhi BPT/BOT/BPO Admission 2018 online application process will start on 20 April 2018. Candidates can fill the online application form from the official site iphnewdelhi or from the direct link given here. Pt. Deendayal Upadhyaya Institute for Physically Handicapped (PDUIPH) is an autonomous organisation under the administrative and financial control of Ministry of Social Justice & Empowerment, Government of India. 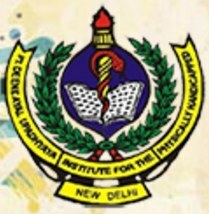 PDUIPH Admission 2018 will be done based on the entrance exam which will be held in Delhi. Scroll down to get complete details about Pt Deendayal Upadhyaya Institute Delhi BPT/BOT/BPO Admission 2018. All the three courses are recognised by the University of Delhi. Class 12 pass out candidates are eligible to apply for the entrance exam. Applicants can apply for the admission in online mode only. Age: The candidates should have completed 17 years of age on or before 31 December 2018. The maximum age limit is 23 years for General category candidates & OBC and 28 years for SC/ST/PH category candidates. An examination recognised as equivalent thereto with Physics, Chemistry, Biology and English (PCBE) for BPT/BOT and Physics, Chemistry, Biology/Mathematics and English (PCME)/(PCBE) for BPO, provided the student has passed in each qualifying subject separately before the date of admission. Indian School Certificate Examination of the Council for the Indian School Certificate Examination or equivalent with PCBE for BPT/BOT and PCBE/PCME for BPO. The candidates who have passed one of the above 12 class examinations with PCME are eligible for BPO course only. Candidates appeared/appearing in the board exams can also apply for the admission, however, such candidates have to meet the minimum eligibility criteria. Percentage of marks in the Qualifying Exam: The candidates should have secured a minimum of 50% marks in aggregate in above mentioned 4 qualifying subjects for general category and 45% for SC/ST/PH and Children/Widows of Armed Personnel including Paramilitary Personnel category. The online application process for Pt. Deen Dayal University (DDU) will start from 20 April 2018. The eligible candidates have to submit the application form ONLINE only. The link to fill the application form will be available on the official website from 20 April 2018. Candidates can also fill the application form from the direct link given on this page. STEP 1: The candidates have to click on the link for online application for entrance Exam session 2018-19 and register first by providing Email ID, Mobile No., Bank Demand Draft No. of the entrance test fee. STEP 2: Now the candidates can click on Apply online option available on the subsequent screen. STEP 3: In case if the candidates want to make changes/corrections to the previously filled form he/she can choose the option to modify application details. STEP 4: After completing the application form provided online, the candidates will have to finalise the application form by clicking on the option finalise the application. STEP 5: Once the application form has been finalised, the candidates can download filled application form from the option download filled Application Form. STEP 6: Applicant has to take the printout of the completed application form downloaded and the candidates should mark their thumb impressions on it, as prescribed. The eligible candidates who have filled the PDUIPH application form through online mode have to submit the application form online only. There will not be any offline process for submitting the application form. Candidates are advised to check all the details on the application form before submitting it. They can take two/ three printouts of the submitted application form for future reference. The selection of the candidates for admission to BPT/BOT/BPO programs will be made on the basis of marks secured in the Entrance Test. There will be a Common Entrance Test for BOT, BPT and BPO courses which will be conducted by PDUIPH as per the directions of the University of Delhi. The candidates opting for BPO course will have the option to attempt questions either in Biology or Mathematics depending upon their subjects in the qualifying examination (i.e. 10 + 2). Such candidates will opt the subject in the Application form in the appropriate column to appear in the test. Rest of the questions in the subjects of Physics, Chemistry, Gen. Knowledge and English will be same for all candidates. All Indian candidates who apply for admission to the courses of BPT, BOT and BPO will have to appear in the Entrance Tests as above. Four Marks will be given for each correct answer.